Apple is really great at giving you things you never thought you needed. 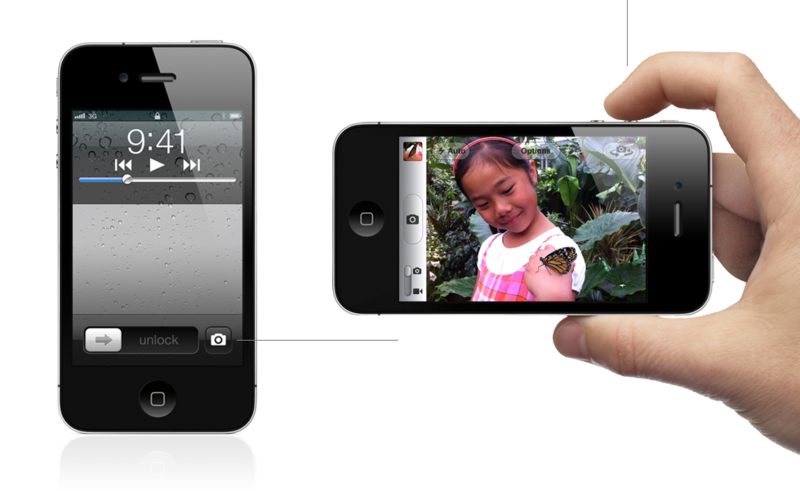 I remember thinking with iOS 4 and 4.3 came out with all their new features, that we must have everything now. The phone is awesome and what else could you really want or need?! I guess that’s the way life is with technology—just as you settle in with your new device, along comes another one to make you feel like you’re behind the curve again. Notification Center – As it is right now, whenever you’re using an app or playing a game on your device, you will be rudely interrupted if you get a text message or some other app notification. To retrieve your message, you have to exit the app and then come back to it and some apps might not return you to where you were. With Notification Center, all messages and alerts appear at the top of the app in a little information bar which you can then pull down with one swipe, reply to a text, acknowledge an alert or whatever else you need to do and then make it disappear having never to leave your app or game! Another great feature of this is that these notifications also appear on the lock screen. They are fully functional too, so you can listen to voicemails or read texts without having to unlock your phone and access them directly. I wonder how it’ll handle privacy for those of us who don’t allow the content of text messages to appear on a locked device. Camera – How can you better a camera that already has physical specs that can’t change? Oh yeah, make it available to use without having to fumble around with passcodes and icons. Such a simple solution to a really annoying problem. There’s an old saying that says “The best camera is the one you have at the moment.” and how true is that when you’re out and about and you see something you really wanted to take a picture of, but you missed it because you took your phone out and you spent 30 seconds trying to enter your passcode and then remember where you put your camera app icon? No more worries with that one! iOS 5 allows you to access your camera right from the lock screen and what’s even better is the ability to take shots using the volume-up button! Adding to this amazing feature is the ability to use grid lines to compose a shot and then perform basic editing like redeye removal, cropping and autoexposure to clean up your photos. When using iCloud, all the photos you take are instantly sent to all of your other iCloud devices. How much better can this get?! 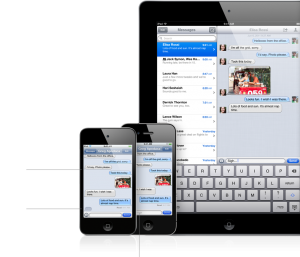 iMessage – Text messaging has replaced phone calls, but for those of you who don’t like paying for texts or maybe you’re an iPod Touch user or non-3G iPad user and you can’t use text. Or at least if you wanted to, you had to download an app for it. Well not anymore! 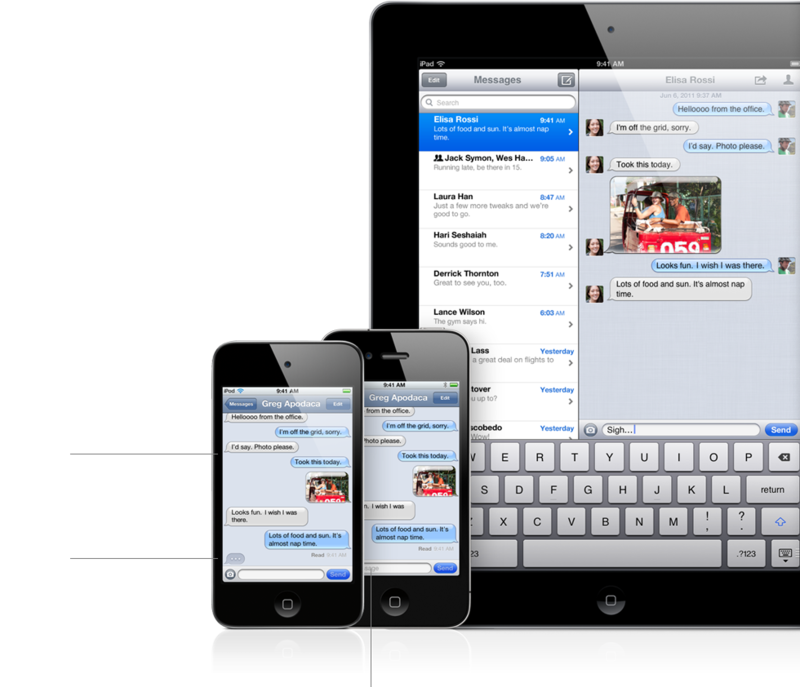 With iMessage, you can now send texts from any 3G or wi-fi connection to and from all iOS devices and just about any other 3G text-capable device. Plus, you can now see when the other person is typing. Another neat feature is the ability to start a text conversation on your iPhone and continue it on your iPad—no more fumbling around between devices. A couple of other cool features are the ability to track sent and received messages through tracking receipts and the universal ability to send group messages as well as photos, locations, contacts and videos to all iOS devices. Newsstand – For those of you that have digital subscriptions to magazines or newspapers, you now have a better place to get the latest issues. Before, you were probably downloading them one by one or having to use the publisher’s app to get the latest edition, but now Newsstand will organize all of you subscriptions in one central location. When a new issue comes out, it’s automatically sent to Newsstand with an image of the newest cover automatically. If you want to manage your subscriptions or purchase new ones, you can do so right from Newsstand or access the new subscription store in iTunes. I only feel sorry for today’s paperboy! Reminders – There are literally tons of reminder apps out there—some are free, some you have to pay big bucks for. What I never understood is why didn’t Apple ever make their own a long time ago?? Now, we don’t have to worry about that. Reminders makes creating to–do lists super easy. You can create any number of things you need to do complete with due dates, locations and alerts. What’s really cool about the location feature is let’s say you create a grocery list and you map it to your favorite grocery store. On the off-chance that you forgot you actually made the shopping list, you might have gone shopping and didn’t remember some items, right? Not with Reminders!! With location mapping, as soon as you pull into the parking lot of that store, you are sent an alert that reminds you about your shopping list. This app appears to be absolutely amazing; especially for someone like me who always forgets the little things. From what I see so far, iOS 5 is just more proof that Apple keeps delivering great features with every new update they put out. I know a lot of Droid owners will probably read this and say they’ve had features like this for a long time now, but what I love about Apple is these features are integrated into more than just one device and the they are created by Apple directly. I for one would prefer not to use third-party apps because sometimes they don’t always play well with devices. At any rate, I can’t wait for this release and if you’re interested in seeing the complete list of features within iOS 5, check out Apple’s website.